Took delivery of the two Azada,s I bought from "get digging", and used it today for the first time. Having not used one before I was perhaps a bit sceptical when I ordered them, but they are brilliant, I dug nearly three times as much with the azada, then I did using a spade. my lottie is pretty compacted and the azada made light work of it. Also it was less tiring to use then a spade. I can see me using this tool quite a bit. I used to work in a helium gas factory, but I walked out, no one talks to me like that. That's good news Skiprat. I've got one on order. Worzel still has some compacted soil to dig over. They're great for breaking up soil and levelling and scraping. Which sizes have you got? "Every day's a school day!" Hi Neil, I bought the largest heavy duty jobby and also the light/medium one for lighter jobs. They are well worth the investment and could see it been my main tool. Yesterday I scraped all my paths clean and it made a grand job. I've got a medium one and it can cut through most things. Trouble is, I welded steel tube to the old cut-out spades, and they both finished up to heavy to use for more than a few minutes ! i'm working on wearing out long handled spade number two. like you,Baz, i can't understand why anyone would use a "normal" one. as for the azada's, if i see one on my travels, i might very well get one, they are spoken very highly of, on here. I'm with you on the shovel, Baz. I used to use one regularly but switched when I got a high quality stainless bladed spade on sale. Must say that my back is feeling the worst from using the shorter spade, so I"m back to using my long handled shovel until I can afford an azada. I just use the spade to edge beds and such. 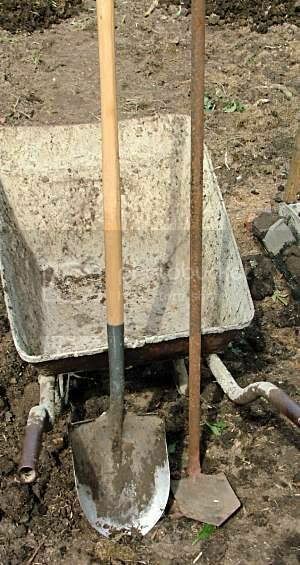 I have tried one of these shovels and there ok for loose stuff like a pile of soil or sand when your filling a barrow .I found it useless when trying to turn some ground over.you cant get a grip of the handle so for digging your plot i will stick to my D handle. ps why is it all those grave diggers in the movies use them ? so as to get a longer "throw" when 6ft down.